TIME MOVES REALLY FAST, DOESN’T IT? It’s nearly two years ago since we moved back to the UK from Dubai and here we are packing up everything yet again and moving all our life to Oman. It’s amazing how much stuff there is to do before a move. Especially a big move like this. Let’s be honest moving house is stressful, moving country is a whole different ball game! I was sat going through paperwork the other day and started to read through our tenancy contract. There it was in the small print. Carpets must be cleaned at the end of the tenancy. This I believe is in our contract because we have Monty the cat. I’m not gonna lie, when I read this I started to stress just a little. I mean carpet cleaning isn’t really a skill of mine. I started looking into companies and realised pretty quickly that this whole carpet cleaning thing can get quite expensive and, to be honest with you the thought of having extra people in the house under my feet whilst trying to sort things wasn’t all that appealing. Then I remembered many moons ago that my mum hired a carpet cleaner from a company that she found in the “Yellow Pages”. I decided to do a search using Google… NOT THE YELLOW PAGES! 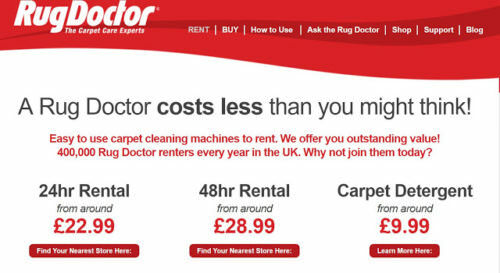 I soon found a company called RUG DOCTOR. I had a little read through the web pages and then decided to click on the page which said rental prices. I held my breath as I clicked on the link as I expected to be greeted with a list of really high prices yet again. However, this was not the case I was grinning from ear to ear pretty quick as I read down the page. £28.99 for 48 hr rental... I mean how good is that! Also, the best this is that you can actually pick it up at local supermarkets or stores. 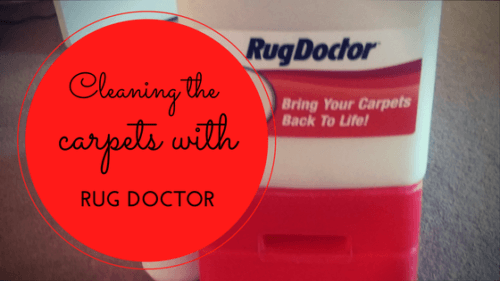 Well, this HOW TO CLEAN MY CARPETS page will tell you in detail how to use the Rug Doctor. Also, this video was so super helpful when it came to working out how to use the Rug Doctor. WAS THE RUG DOCTOR EASY TO USE AND DID IT DO ITS JOB? Yes, yes and yes! I’m well impressed with the Rug Doctor and I would definitely hire one again. At first, it felt weird using it and it took me ages just to do one little square of carpet. However, after a while, I became a pro and found myself scooting around from room to room. I’m really happy that we used the Rug Doctor as it fitted around our moving house schedule beautifully and also fitted around looking after our two-year-old boy as it meant that I could stop now and the and go and play or change a nappy etc. and then come back to the carpet cleaning as and when. This entry was posted in Carpet Cleaning. Bookmark the permalink.